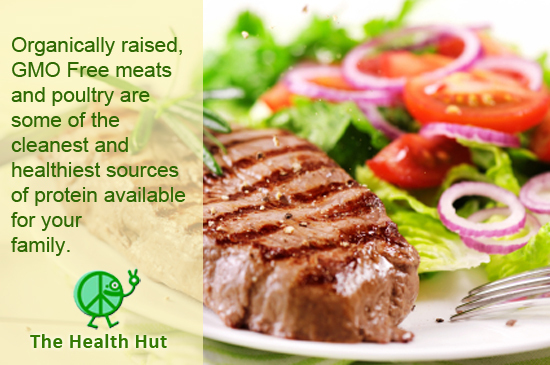 The Health Hut stocks organically raised meats, poultry, and when available, wild caught seafood. Animals raised naturally and humanely are not only safer for your family - they taste better, too. We guarantee that you'll be pleased - or your money back. the Snyder Family Farm, in nearby Granite Falls. Free-range and organically raised poultry, beef & pork are some of the cleanest, healthiest sources of protein available anywhere. It's also some of the juiciest and most delicious meat you will ever try. 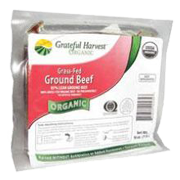 Organic poultry and meats are raised according to the USDA's demanding standards for organic products. Raised in a wholesome environment, often on nearby family farms, organic meats tend to be lower in saturated fat and cholesterol. Animals that are raised as nature intended with plenty of sunshine, fresh air, and vegetarian feed, tend to be healthier and happier, and also create better products for our customers. We stock a plentiful assortment of naturally raised meats and poultry products, many grown locally on farms close to Hickory. Visit the Snyder Family Farm near Granite Falls to learn more about meats raised the old fashioned way.